Even at budget and mid price there is no shortage of decent performances of The Planets in the catalogue. At around five pounds however this Philharmonia performance under the dependable guidance of Leonard Slatkin has to be considered excellent value for money, especially as there is a more than acceptable Vaughan Williams Tallis Fantasia thrown in for good measure. The RCA Red Seal "Sound Dimension" series have all been remastered using 24-bit technology and whilst a recently reviewed simultaneous release of Stravinsky ballet music by the RPO under Yuri Temirkanov was not so successful, in this case at least the sound is full, well balanced and vividly realistic. Mars begins in a suitably ominous manner, the brass section showing themselves to be in fine fettle, although it is a shame that the central glowering string section lacks the necessary brooding menace. As a result the movement does not quite achieve the optimum degree of cumulative momentum. 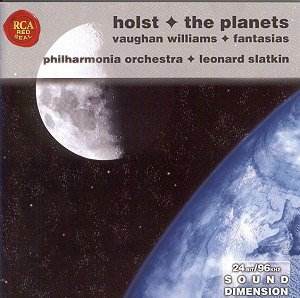 Venus is appropriately calm and serene (some beautifully ethereal sounds from the strings here) whilst Mercury is an impressively delicate and fleet footed winged messenger, the orchestra responding to Slatkin�s direction with some particularly taut woodwind ensemble. Jupiter is exceptionally well played with particularly impressive brass once again. It may not be quite up there with the best for sheer jollity but is enjoyable nonetheless. It is well known that Saturn was the composer�s personal favourite and it always strikes me as the most difficult movement to pull off convincingly. Here Slatkin gets the inexorable tread of the music just right, the opening atmosphere daunting, the slow martial crescendo to the huge central climax finely paced and the feeling of tranquillity and reconciliation in the closing paragraphs beautifully handled. By comparison Uranus could perhaps be a little more grotesque in the central maniacal march but overall comes off well. Unfortunately it is Neptune that for me, lets the performance down. This movement rarely fails to send a shiver up my spine but I am afraid a lack of ebb and flow in the phrasing, coupled with a few "lumpy" entries spoil the sense of mystery. The New London Children�s Choir sings well although I have to say that I find a ladies choir to be more effective in the closing bars. Overall though, this does not mar a performance that ultimately has much to offer. At over seventy minutes total playing time the inclusion of the Vaughan Williams Greensleeves and Tallis Fantasia only serve to add to the excellent value of this disc. The Tallis Fantasia in particular is a rewarding performance, maybe lacking the sense of profound rapture and depth of tone to place it with the finest but warm in spirit and enjoyable never the less. In conclusion, a disc that offers undeniably good value for money coupled with decent, solid performances. However, I can�t see anyone who already has their favourite recordings of these works putting the disc to the top of their list.